Just South of Pasadena is a small city appropriately named South Pasadena. It is a city in Los Angeles County, California. South Pasadena is less than three and a half miles and is bordered by Pasadena to the North, San Marino to the NorthEast, Alhambra to the South, and Highland Park to the West. Fair Oaks, Huntington Drive, and Mission Street are the main passageways through South Pasadena. South Pasadena is a small town of about 25,000 residents, and is known for its excellent public schools and family-like community. Per the 2000 US Census, the median income for a household in the city was $55,728, and the median income for a family was $72,039. For all people who love running, every year on the first Saturday of December, South Pasadena hosts a 5K/10K run around the city. South Pasadena’s history is commonly associated with places that played important roles in the city like Fair Oaks Pharmacy and Soda Fountain, The Rialto Theatre, and Cawston Ostrich Farm. Fair Oaks Pharmacy and Soda Fountain – Back in the day, this hot spot was for people to meet at the store to grab a bite to eat, or just relax with family and friends. Do not be fooled by the vintage look of the place, they say what they have to offer is thoroughly modern. The Rialto Theatre – Built in 1925, The Rialto Theatre, is one of the last remaining single-screen movie places in the Los Angeles Area! Cawston Ostrich Farm – Opened in 1886, Cawston Ostrich Farm, was America’s FIRST ostrich farm! See pictures here! South Pasadena, interestingly enough, has been involved in a lot of movie productions including The Terminator, Gone with the Wind, Halloween, American Pie, Legally Blonde, 13 Going on 30, Back to the Future, Mr. Deeds, and Bruce Almighty. And these are only some of the movie/TV show productions that have been filmed in this city! South Pasadena’s neighboring city San Marino has always been its rival. Beginning in the 1900’s, until now, South Pasadena High School and San Marino High School have met during football season to combat for a victor’s plaque that has been juggled back and forth between the two rivalries! Heirloom Bakery & Café – In the artsy Mission West district of South Pas, this colorful café features breakfasts, quiches, salads and pizza, plus freshly baked breads and scones. Personally, this is my family’s favorite breakfast hangout – it’s hard to pick which cupcake to have. You absolutely have to try the carrot cupcake – to die for! The Moo on Mission of Mother Moo Creamery & Marketplace (Sierra Madre) moved into Buster’s Ice Cream & Coffee Shop location, April 2016. Mother Moo has now taken on the role of serving great coffee, fabulous pies, cookies and more, in this quaint two-story building, perfect for families, students and all coffee lovers! Canoe House – The owners of Wild Thyme Cafe reinvented themselves and started a Hawaiian inspired restaurant with both flavors and interior design from the tropical islands. Excellent place for breakfast. See reviews here! Mike and Anne’s – A local favorite with a modern look, large outdoor patio and great bar area. They serve great new American style lunch and dinners and best of all, brunch!! Perfect place to bring your loved ones. Gus’s Barbeque – Let your inner meat lover out at Gus’s. Beer braised beef brisket, pulled pork, slow smoked spare ribs are just some of their mouth watering dishes. Their salads and sandwiches are also worth a try. On weekends they serve their southern style breakfast..and the cinnamon skillet bun is a winner! Modan Artisinal Ramen – Cozy go-to place for ramen noodle in South Pasadena. Great selection of really flavorful appetizers, rice and noodle bowls. Might require a wait time during evenings and weekends but worth it. It is open from 1 pm – 4 pm on Saturday and 3 pm – 8 pm on Thursday (Farmer’s market Thursdays!). palaces in the Los Angeles Area. Garfield Park – A great place for strolling or play tennis in the beautiful nature. Very family friendly and a fun place for children. Make sure to see the meditative garden space. Arroyo Seco Golf Course– Rated as one of LA’stop 10 par 3 gold courses! to join this archery club. South Pasadena gives horse-back riding lessons and boarding! Need transportation fast and easy? Well, one of the more convenient things about living in South Pasadena is that there is the Metro Gold Line Mission Station located right in the heart of the city (on the corner of Mission and Meridian). The South Pasadena Unified school district includes five schools: three that are Elementary Schools (Monterey Hills, Marengo and Arroyo Vista), South Pasadena Middle School, and South Pasadena High School. Three bedrooms plus an office! Move into this spacious, full-of-light single story house and enjoy its great location in a safe and friendly neighborhood with great South Pasadena schools. Several parks, stores and restaurants are within walking distance. Visit the local farmers market on Thursday or simply relax in your large private backyard with wonderful fruit trees. Or stay inside— it will be a pleasure to stay in, as all the rooms are spacious with high ceilings. In the back behind the garage you will find two bonus rooms: One you could turn into a home gym, a hobby room, or a playroom— just use your imagination! The second could be a workroom. Commuters! You will love how easy it is to get on major freeways and thoroughfares like Huntington Drive and Atlantic Blvd. Laundry room off of the kitchen, excellent floor plan, huge storage area in the garage, and so much more that I'll let you discover for yourself when you come to see this wonderful home. The price is right, the timing is right— don't wait, call now! LOCATED ON TREE LINED STREET. UNIT HAS A VIEW OF TREETOPS IN THE CITY OF SOUTH PASADENA SCHOOL DISTRICT 2 BD, 2 BA, PLUS HUGE ENCLOSED PATIO, PRIVATE LAUNDRY ROOM. THIS BRIGHT AND SPACIOUS 2BD + 2 BA CONDO OFFERS GREAT FLOOR PLAN WITH AN ENCLOSED PATIO AREA TURNED INTO AN ADDITIONAL DEN. REMODELED KITCHEN CABINETS, GRANITE COUNTER TOPS, PLANTATION SHUTTERS, 6 PANEL DOORS, HARDWOOD FLOORS AND CARPET, UPGRADED BATHROOMS & PRIVATE LAUNDRY. NOBODY LIVING ABOVE OR BELOW UNIT, 2 DEEDED PARKING SPACES, 1 PARKING GARAGE WITH PLENTY OF STORAGE ON THE LEFT SIDE OF THE PARKING AND IN THE CABINETS ABOVE THE BACK OF THE PARKING. 1 ASSIGNED CAR PORT. PET SMALLER THAN 20 LBS ALLOWED. ENCLOSED PATIO MIGHT NOT HAVE CITY PERMITS. BUYER TO SATISFY SELF IN REGARDS TO SQUARE FOOTAGE AND CITY PERMITS. Listed with Evan T. Fujii CalDRE: 01370718, Wilshire Metro Realty, Inc. Welcome to your chic new loft in the historic Ostrich Farm Complex of South Pasadena. The property is in excellent condition and is a top floor unit featuring 2 Bedrooms and 1 Bath. Dramatic 15ft+ high ceilings and concrete walls provide a blank canvas for your creativity. Enjoy the exposed brick facade, large panel glass windows, and steel seams as you ponder your next company startup. The home has central air and heat and features in-unit laundry. Two deeded parking spaces are included along with ample guest parking. The well-maintained historic brick building sits on the site of what was once an Ostrich Farm and later converted to industrial buildings. Adapted as lofts in 2006, the building sits within the coveted South Pasadena School District. Enjoy quick access to the Gold Line Light Rail plus all the Shops, Cafes & Trader Joe's nearby on Mission Street. Highland Park and Eagle Rock are just a stone's throw away for trendy dining, shops, and vibrant nightlife options. Appliances included. Listed with Vilma Bakly CalDRE: 00965091, Berkshire Hathaway Home Serv. The 3 bdrm/1ba craftsman home was built in 1907. The rear 2 bdrm/1 ba, 2-story units (A and B) were built in 1964. Separately metered for gas and electric. The property has been owned for many decades by a family who is a motivated seller. South Pasadena has high barriers to entry; stable; outstanding schools; close proximity to the Metro and major E/W and N/S transportation corridors. There is potential for rent increases and long-term hold appreciation potential. Listed with Charles Dunn CalDRE: 00965553, NAI Capital, Inc. Listed with David Bryant CalDRE: 00336457, Bryant Properties, Inc. Please visit our real estate listing feed for all details on available condos and townhouses and single family homes for sale in South Pasadena. 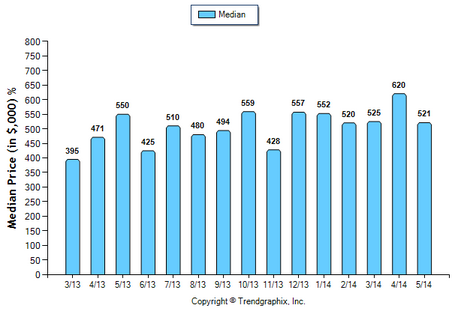 If you are looking for home sales statistics in South Pasadena, you've come to the right place. Below, you will find some at a glance charts to get you started. However, if you'd like specifics on the actual homes sold with their addresses, homes for sale, all averages and more, please visit our South Pasadena Market Update page. You can also sign up to receive monthly updates of this information on that page. If you own or are thinking of buying a home in South Pasadena California, bookmark this page for updated information on the latest real estate data. The inventory of available single family homes for sale in South Pasadena has been consistent at about 15 or so available each month. 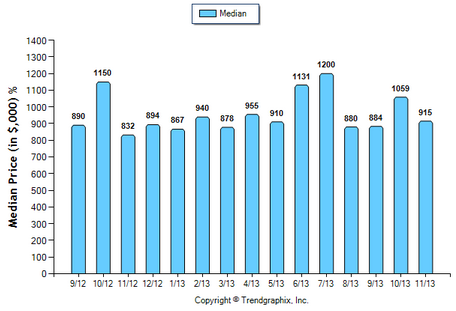 The demand has been on the rise with 21 homes actually going under contract (in escrow) in August. Rule of thumb on whether or not we're in a seller's or buyer's market depends on the months of available inventory for sale. 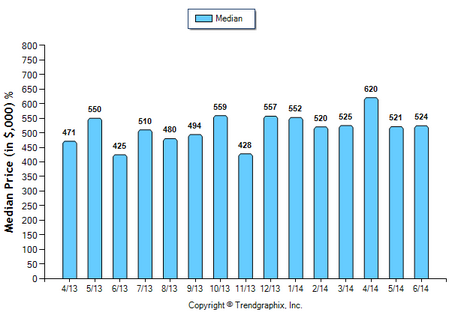 6 months or less is considered a seller's market. In the last two months, South Pasadena months of sale is at or under 1 month. Most properties sell at or above asking price as can be seen by Sold/List Diff % above. Multiple offers are not uncommon and many cash buyers and investors are out in the market place driving the average sold price over $1 million. 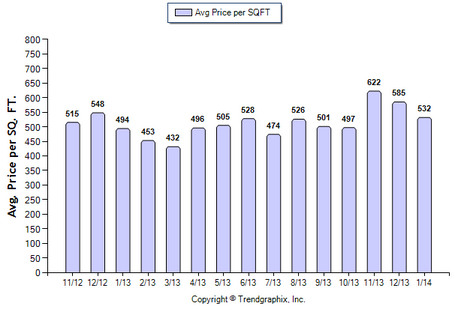 Price per square foot for August closed at $526. It's always good to compare and look at historical data for perspective. 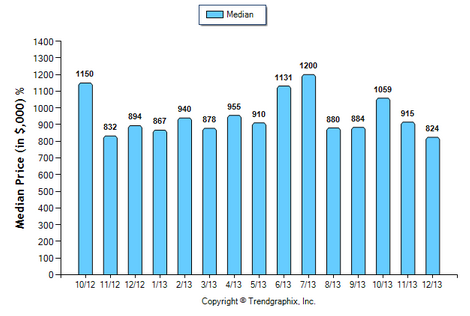 Average sold price and active price in South Pasadena increased by almost 18% since January 2013.